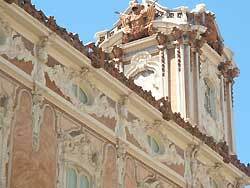 The Ceramics Museum is housed in the Palacio de Marques de Dos Aguas, a luxurious palace that combines rococco, neo-classical and oriental elements. 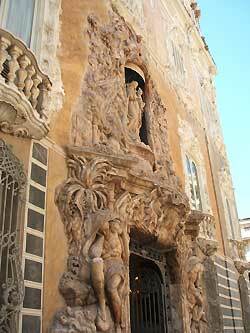 The unbelievable baroque entrance to the building never fails to impress the visitors. The rich ornament of the building is enough incentive to come here even if you don't intend to go inside. Inside, however, more marvel awaits you - the fully furbished interior of the palace and the best of ceramics that Valencia had to offer through the centuries. History: the palace dates from as far back as XV century, although it has been fully re-shaped since then. 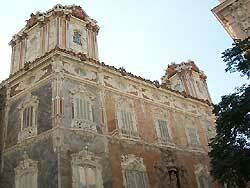 Home to a Valencian noble family - the Marquis de Dos Aguas, it was originally a Gothic building. 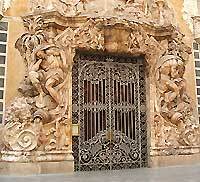 In 1740 it was re-shaped to Baroque by Hipolito Rovira, and it is then that the famous entrance was added. 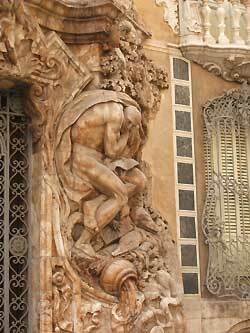 The last modification took place in 1850s-60s, when the entire facade was redesigned to a hybrid of newer elements. In 1949 the palace was bought by the Ministry of Education to house the collection of ceramics donated by Dr. Gonzalez Marti.